I bought this phone 3 months ago and I am very happy with this phone.front and back both cameras are very good. Battery backup is good too. I like face detection technology in this phone. I captured some pictures through the camera the pictures captured are just awesome. Quality of the phone is good. Battery back up is upto the mark. overall recommended to all those who are looking for phone in this price range. Latest price of Huawei Honor 9 Lite 64 GB in India was fetched online from Flipkart, Amazon, Snapdeal, Shopclues and Tata Cliq. 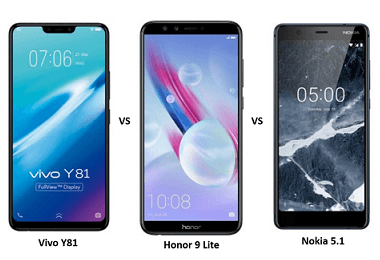 "Vivo Y81 vs Honor 9 Lite vs Nokia 5.1: Price, Software and Hardware Configuration Compared"